My bubble airplane valentines are similar to the valentines I found on Pinterest but in my opinion, these are a little more versatile. Why? Because you can print the writing on either side of patterned paper or on plain paper. You can also use blue toned bubbles and paper to make them more boy-ish. Bubbles are better than candy because you don’t have to worry about allergies! 1) Click on the photos below to download them. 2) Print the wings on whatever paper you want, on the patterned side or plain side. 3) Print the banners on paper. 4) Cut the slits on the wing so that you can thread the bubbles through. 5) Use hot glue to attach the banner with a piece of ribbon to the bubbles. 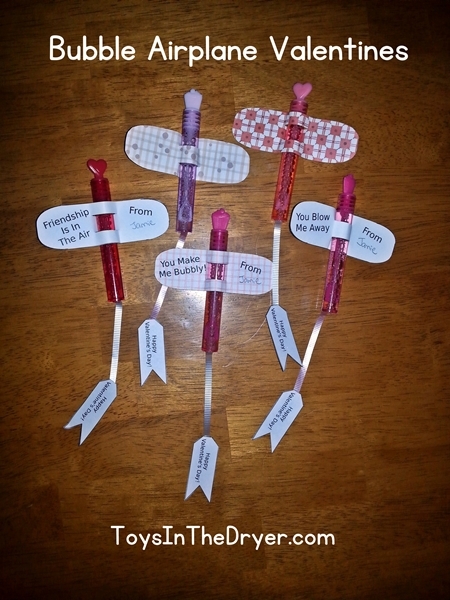 There you have it…bubble airplane valentines!